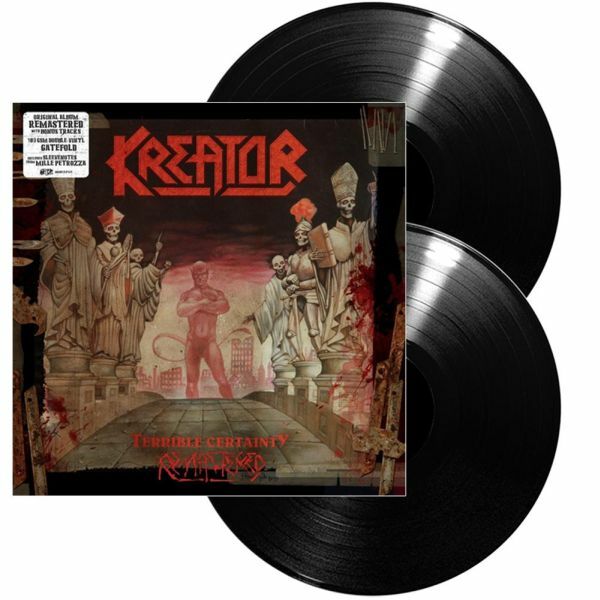 KREATOR - TERRIBLE CERTAINTY VINYL RE-ISSUE (2LP) | Online Shop | Wizard LTD. Album: "TERRIBLE CERTAINTY VINYL RE-ISSUE (2LP)"
1987’s Terrible Certainty did nothing to dent the perception that Kreator were one of the genre’s best bands, and for once, Petrozza had a little time to work out the songs beforehand. Kreator beefed up to a quartet once again with the addition of guitarist Jörge Trebziatowski. This version also contains the Out of the Dark…. Into the Light EP which was originally released in 1988. The live tracks were recorded at Dynamo Club, Eindhoven, Netherlands, in 1988.